The poster-child for anime excess and impractical outfitting becomes a fighting game. Studio Trigger's infamously over-the-top anime series Kill la Kill is finally getting a fighting game adaptation, and it will be landing on PC sometime in 2019. Kill La Kill the Game: IF (to give its full triple-barrelled title) is a one-on-one 3D arena fighting game, not entirely dissimilar to Bandai Namco's Naruto: Ultimate Ninja Storm series. The trailer—debuted at Anime Expo 2018 on Friday—gives us a look at the anime's two leads crossing swords. Kill la Kill was a raunchy and anarchic action/comedy anime series that started in late 2013, following the adventures of rowdy teenage swordswoman Ryuko Matoi on a quest to track down her dad's killer. The tale rapidly jumped the rails and escalated into a spectacular and increasingly surreal yarn involving sentient, super-powered and extremely skimpy clothing. While prolific fighting game studio and publisher Arc System Works (who recently made a splash with Dragon Ball FighterZ) are getting top billing on this as publisher, Kill la Kill the Game: IF is being developed by Japanese studio APlus. It's a possible reason for concern, given that their most recent game—Little Witch Academia: Chamber of Time—wasn't much fun to play, despite looking and sounding authentic to its source material. 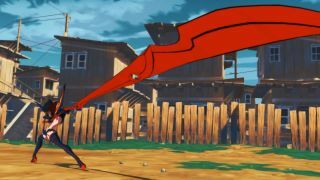 Kill la Kill the Game: IF is due for release in 2019 for PC and PlayStation 4, but will be making its first public demo debut at fighting game tournament Evo 2018 in August.